(10)TEN NEW WITH OUT Box Sensor NEW BATTERIES INCLUDED. Honeywells 5800PIR Series of Wireless Motion Detectors are high-performance, easy-to-install sensors featuring sleek, compact designs that are ideal for applications where aesthetics or discretion are critical. On the 5800PIR and 5800PIR-COM, PIR sensitivity and temperature sensing can be enabled via programming locally or from the central station. Installation is easy, with no jumpers, switches or disassembly, fewer mounting restrictions and an automatic walk test mode that turns on the walk test LED for ten minutessaving installers one trip up the ladder for each sensor. Other notable benefits include fewer service calls thanks to a long-life battery and empty cases which allow designers and end-users to custom-paint the motion detectors to match any residential or commercial setting. The 5800PIR blends perfectly with all of the 5800 Series family of sensors for a seamless look. Faster and Easier to Install Specific features that contribute to this benefit include: Automatic walk test Flashlight walk test No DIP switches/jumpers Remotely programmable sensitivity No mounting height adjustments Circuit board does not need to be removed to install on wall Ceiling and wall mounting brackets help to easily direct the pattern where needed 7′-9′ mounting height means fewer restrictions than current offerings (6.5′-7.5′) Easy opening case Covered circuit board reduces risk of installer initiated damage. Fewer Service Calls Incorrect installation of equipment or changing requirements of the site (new pets) is no longer a problem Automatic walk test mode turns on the walk test LED for ten minutes when cover is opened and closed or when a battery is installed. Walk test mode can also be triggered with a flashlight on the 5800PIR and 5800PIR-COM. Remotely programmable Longer battery life End-user replaceable batteries Black bug guard means 15% fewer false alarms due to bright lights directed into the PIR UV protected lenses (on all models except 5800PIR-RES). Smaller/Better with a Family Look The new PIRs are 50% smaller than the 5890PI. Also, dealers can install one family look whether they use hardwired, V-Plex or wireless in order to complete the job. In addition, if the dealers need to mix and match sensing technologies, the look of the installation is consistent. Less Costly Maintenance Only one battery to replace. Decreased Liability Self testalerts end-user and central station if the motion detector stops functioning (except 5800PIR-RES). Optional Cold Temperature Alert (< 45° F) warns when temperatures are approaching the freezing point (except 5800PIR-RES). Commercial Dealer Additional Benefits New longer range patterns allow more wireless options Colder operation down to -20° C (-4° F) for use in unheated areas Look down option provides increased security right below the detector Back tamper switchrequired for commercial certificated installations. Honeywell VISTA-20HW AND MORE. These are brand new items and they won't last long. We cannot accept P. Boxes, please provide a physical address and check that it's the right address before purchasing. As veteran sellers we are committed to your satisfaction. We are here to provide you the best prices, the most quality items and the most human customer service. We are obligated to our customers satisfaction and we will never leave a customer behind! Your feedbacks and DSRs are very important to us in order to succeed and serve more happy customers. You can find an outstanding selection of the hottest items in different categories. No matter what you need, you will find it here. We are always looking to grow, bring more quality items and serve more happy customers. We are committed to answer any question within 48 hours. The item along with all packaging must be taken into your local post office for inspection. Please let us know if you need assistance. We will work together to resolve the issue. The item "10 NEW-ADEMCO-ADT-HONEYWELL-5800PIR-RES-Wireless-Passive- Infrared Motion Sensor" is in sale since Saturday, July 16, 2016. 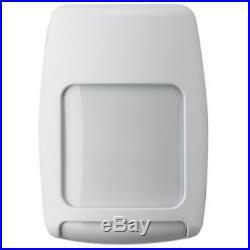 This item is in the category "Home & Garden\Home Improvement\Home Security\Sensors & Motion Detectors". The seller is "runtwobuythis16" and is located in Waukesha, Wisconsin. This item can be shipped to United States, to Canada, to United Kingdom, DK, RO, SK, BG, CZ, FI, HU, LV, LT, MT, EE, to Australia, GR, PT, CY, SI, to Japan, to China, SE, KR, ID, to Taiwan, ZA, TH, to Belgium, to France, to Hong Kong, to Ireland, to Netherlands, PL, to Spain, to Italy, to Germany, to Austria, RU, IL, to Mexico, to New Zealand, PH, SG, to Switzerland, NO, SA, UA, AE, QA, KW, BH, HR, MY, BR, CL, CO, CR, PA, TT, GT, HN. (10) NEW WITH Boxes Sensor NEW BATTERIES INCLUDED. Honeywells 5800PIR Series of Wireless Motion Detectors are high-performance, easy-to-install sensors featuring sleek, compact designs that are ideal for applications where aesthetics or discretion are critical. On the 5800PIR and 5800PIR-COM, PIR sensitivity and temperature sensing can be enabled via programming locally or from the central station. Installation is easy, with no jumpers, switches or disassembly, fewer mounting restrictions and an automatic walk test mode that turns on the walk test LED for ten minutessaving installers one trip up the ladder for each sensor. Other notable benefits include fewer service calls thanks to a long-life battery and empty cases which allow designers and end-users to custom-paint the motion detectors to match any residential or commercial setting. The 5800PIR blends perfectly with all of the 5800 Series family of sensors for a seamless look. Faster and Easier to Install Specific features that contribute to this benefit include: Automatic walk test Flashlight walk test No DIP switches/jumpers Remotely programmable sensitivity No mounting height adjustments Circuit board does not need to be removed to install on wall Ceiling and wall mounting brackets help to easily direct the pattern where needed 7′-9′ mounting height means fewer restrictions than current offerings (6.5′-7.5′) Easy opening case Covered circuit board reduces risk of installer initiated damage. Fewer Service Calls Incorrect installation of equipment or changing requirements of the site (new pets) is no longer a problem Automatic walk test mode turns on the walk test LED for ten minutes when cover is opened and closed or when a battery is installed. Walk test mode can also be triggered with a flashlight on the 5800PIR and 5800PIR-COM. Remotely programmable Longer battery life End-user replaceable batteries Black bug guard means 15% fewer false alarms due to bright lights directed into the PIR UV protected lenses (on all models except 5800PIR-RES). Smaller/Better with a Family Look The new PIRs are 50% smaller than the 5890PI. Also, dealers can install one family look whether they use hardwired, V-Plex or wireless in order to complete the job. In addition, if the dealers need to mix and match sensing technologies, the look of the installation is consistent. Less Costly Maintenance Only one battery to replace. Decreased Liability Self testalerts end-user and central station if the motion detector stops functioning (except 5800PIR-RES). Optional Cold Temperature Alert (< 45° F) warns when temperatures are approaching the freezing point (except 5800PIR-RES). Commercial Dealer Additional Benefits New longer range patterns allow more wireless options Colder operation down to -20° C (-4° F) for use in unheated areas Look down option provides increased security right below the detector Back tamper switchrequired for commercial certificated installations. Honeywell VISTA-20HW AND MORE. These are brand new items and they won't last long. We cannot accept P. Boxes, please provide a physical address and check that it's the right address before purchasing. As veteran sellers we are committed to your satisfaction. We are here to provide you the best prices, the most quality items and the most human customer service. We are obligated to our customers satisfaction and we will never leave a customer behind! Your feedbacks and DSRs are very important to us in order to succeed and serve more happy customers. You can find an outstanding selection of the hottest items in different categories. No matter what you need, you will find it here. We are always looking to grow, bring more quality items and serve more happy customers. We are committed to answer any question within 48 hours. The item along with all packaging must be taken into your local post office for inspection. Please let us know if you need assistance. We will work together to resolve the issue. The item "10 NEW-ADEMCO-ADT-HONEYWELL-5800PIR-RES-Wireless-Passive- Infrared Motion Sensor" is in sale since Wednesday, July 13, 2016. 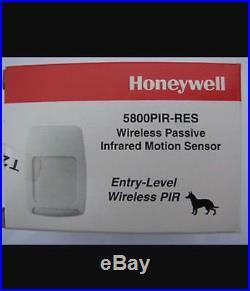 This item is in the category "Home & Garden\Home Improvement\Home Security\Sensors & Motion Detectors". The seller is "runtwobuythis16" and is located in Waukesha, Wisconsin. This item can be shipped to United States, to Canada, to United Kingdom, DK, RO, SK, BG, CZ, FI, HU, LV, LT, MT, EE, to Australia, GR, PT, CY, SI, to Japan, to China, SE, KR, ID, to Taiwan, ZA, TH, to Belgium, to France, to Hong Kong, to Ireland, to Netherlands, PL, to Spain, to Italy, to Germany, to Austria, RU, IL, to Mexico, to New Zealand, PH, SG, to Switzerland, NO, SA, UA, AE, QA, KW, BH, HR, MY, BR, CL, CO, CR, PA, TT, GT, HN. (10) NEW WITH Boxes Sensor NEW BATTERIES INCLUDED. 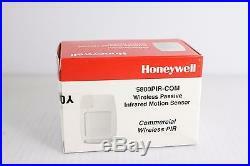 Honeywells 5800PIR Series of Wireless Motion Detectors are high-performance, easy-to-install sensors featuring sleek, compact designs that are ideal for applications where aesthetics or discretion are critical. On the 5800PIR and 5800PIR-COM, PIR sensitivity and temperature sensing can be enabled via programming locally or from the central station. Installation is easy, with no jumpers, switches or disassembly, fewer mounting restrictions and an automatic walk test mode that turns on the walk test LED for ten minutessaving installers one trip up the ladder for each sensor. Other notable benefits include fewer service calls thanks to a long-life battery and empty cases which allow designers and end-users to custom-paint the motion detectors to match any residential or commercial setting. The 5800PIR blends perfectly with all of the 5800 Series family of sensors for a seamless look. Faster and Easier to Install Specific features that contribute to this benefit include: Automatic walk test Flashlight walk test No DIP switches/jumpers Remotely programmable sensitivity No mounting height adjustments Circuit board does not need to be removed to install on wall Ceiling and wall mounting brackets help to easily direct the pattern where needed 7′-9′ mounting height means fewer restrictions than current offerings (6.5′-7.5′) Easy opening case Covered circuit board reduces risk of installer initiated damage. Fewer Service Calls Incorrect installation of equipment or changing requirements of the site (new pets) is no longer a problem Automatic walk test mode turns on the walk test LED for ten minutes when cover is opened and closed or when a battery is installed. Walk test mode can also be triggered with a flashlight on the 5800PIR and 5800PIR-COM. Remotely programmable Longer battery life End-user replaceable batteries Black bug guard means 15% fewer false alarms due to bright lights directed into the PIR UV protected lenses (on all models except 5800PIR-RES). Smaller/Better with a Family Look The new PIRs are 50% smaller than the 5890PI. Also, dealers can install one family look whether they use hardwired, V-Plex or wireless in order to complete the job. In addition, if the dealers need to mix and match sensing technologies, the look of the installation is consistent. Less Costly Maintenance Only one battery to replace. Decreased Liability Self testalerts end-user and central station if the motion detector stops functioning (except 5800PIR-RES). Optional Cold Temperature Alert (< 45° F) warns when temperatures are approaching the freezing point (except 5800PIR-RES). Commercial Dealer Additional Benefits New longer range patterns allow more wireless options Colder operation down to -20° C (-4° F) for use in unheated areas Look down option provides increased security right below the detector Back tamper switchrequired for commercial certificated installations. Honeywell VISTA-20HW AND MORE. These are brand new items and they won't last long. We cannot accept P. Boxes, please provide a physical address and check that it's the right address before purchasing. As veteran sellers we are committed to your satisfaction. We are here to provide you the best prices, the most quality items and the most human customer service. We are obligated to our customers satisfaction and we will never leave a customer behind! Your feedbacks and DSRs are very important to us in order to succeed and serve more happy customers. You can find an outstanding selection of the hottest items in different categories. No matter what you need, you will find it here. We are always looking to grow, bring more quality items and serve more happy customers. We are committed to answer any question within 48 hours. The item along with all packaging must be taken into your local post office for inspection. Please let us know if you need assistance. We will work together to resolve the issue. The item "10 NEW-ADEMCO-ADT-HONEYWELL-5800PIR-RES-Wireless-Passive- Infrared Motion Sensor" is in sale since Wednesday, June 22, 2016. 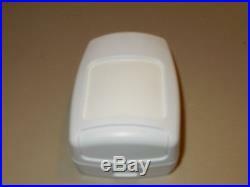 This item is in the category "Home & Garden\Home Improvement\Home Security\Sensors & Motion Detectors". The seller is "runtwobuythis16" and is located in Waukesha, Wisconsin. This item can be shipped to United States, to Canada, to United Kingdom, DK, RO, SK, BG, CZ, FI, HU, LV, LT, MT, EE, to Australia, GR, PT, CY, SI, to Japan, to China, SE, KR, ID, to Taiwan, ZA, TH, to Belgium, to France, to Hong Kong, to Ireland, to Netherlands, PL, to Spain, to Italy, to Germany, to Austria, RU, IL, to Mexico, to New Zealand, PH, SG, to Switzerland, NO, SA, UA, AE, QA, KW, BH, HR, MY, BR, CL, CO, CR, PA, TT, GT, HN. (10) NEW WITH Boxes Sensor NEW BATTERIES INCLUDED. Honeywells 5800PIR Series of Wireless Motion Detectors are high-performance, easy-to-install sensors featuring sleek, compact designs that are ideal for applications where aesthetics or discretion are critical. On the 5800PIR and 5800PIR-COM, PIR sensitivity and temperature sensing can be enabled via programming locally or from the central station. Installation is easy, with no jumpers, switches or disassembly, fewer mounting restrictions and an automatic walk test mode that turns on the walk test LED for ten minutessaving installers one trip up the ladder for each sensor. Other notable benefits include fewer service calls thanks to a long-life battery and empty cases which allow designers and end-users to custom-paint the motion detectors to match any residential or commercial setting. The 5800PIR blends perfectly with all of the 5800 Series family of sensors for a seamless look. Faster and Easier to Install Specific features that contribute to this benefit include: Automatic walk test Flashlight walk test No DIP switches/jumpers Remotely programmable sensitivity No mounting height adjustments Circuit board does not need to be removed to install on wall Ceiling and wall mounting brackets help to easily direct the pattern where needed 7′-9′ mounting height means fewer restrictions than current offerings (6.5′-7.5′) Easy opening case Covered circuit board reduces risk of installer initiated damage. Fewer Service Calls Incorrect installation of equipment or changing requirements of the site (new pets) is no longer a problem Automatic walk test mode turns on the walk test LED for ten minutes when cover is opened and closed or when a battery is installed. Walk test mode can also be triggered with a flashlight on the 5800PIR and 5800PIR-COM. Remotely programmable Longer battery life End-user replaceable batteries Black bug guard means 15% fewer false alarms due to bright lights directed into the PIR UV protected lenses (on all models except 5800PIR-RES). Smaller/Better with a Family Look The new PIRs are 50% smaller than the 5890PI. Also, dealers can install one family look whether they use hardwired, V-Plex or wireless in order to complete the job. In addition, if the dealers need to mix and match sensing technologies, the look of the installation is consistent. Less Costly Maintenance Only one battery to replace. Decreased Liability Self testalerts end-user and central station if the motion detector stops functioning (except 5800PIR-RES). Optional Cold Temperature Alert (< 45° F) warns when temperatures are approaching the freezing point (except 5800PIR-RES). Commercial Dealer Additional Benefits New longer range patterns allow more wireless options Colder operation down to -20° C (-4° F) for use in unheated areas Look down option provides increased security right below the detector Back tamper switchrequired for commercial certificated installations. Honeywell VISTA-20HW AND MORE. These are brand new items and they won't last long. We cannot accept P. Boxes, please provide a physical address and check that it's the right address before purchasing. As veteran sellers we are committed to your satisfaction. We are here to provide you the best prices, the most quality items and the most human customer service. We are obligated to our customers satisfaction and we will never leave a customer behind! Your feedbacks and DSRs are very important to us in order to succeed and serve more happy customers. You can find an outstanding selection of the hottest items in different categories. No matter what you need, you will find it here. We are always looking to grow, bring more quality items and serve more happy customers. We are committed to answer any question within 48 hours. The item along with all packaging must be taken into your local post office for inspection. Please let us know if you need assistance. We will work together to resolve the issue. The item "10 NEW-ADEMCO-ADT-HONEYWELL-5800PIR-RES-Wireless-Passive- Infrared Motion Sensor" is in sale since Thursday, June 16, 2016. 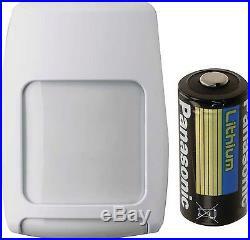 This item is in the category "Home & Garden\Home Improvement\Home Security\Sensors & Motion Detectors". The seller is "runtwobuythis16" and is located in Waukesha, Wisconsin. This item can be shipped to United States, to Canada, to United Kingdom, DK, RO, SK, BG, CZ, FI, HU, LV, LT, MT, EE, to Australia, GR, PT, CY, SI, to Japan, to China, SE, KR, ID, to Taiwan, ZA, TH, to Belgium, to France, to Hong Kong, to Ireland, to Netherlands, PL, to Spain, to Italy, to Germany, to Austria, RU, IL, to Mexico, to New Zealand, PH, SG, to Switzerland, NO, SA, UA, AE, QA, KW, BH, HR, MY, BR, CL, CO, CR, PA, TT, GT, HN.